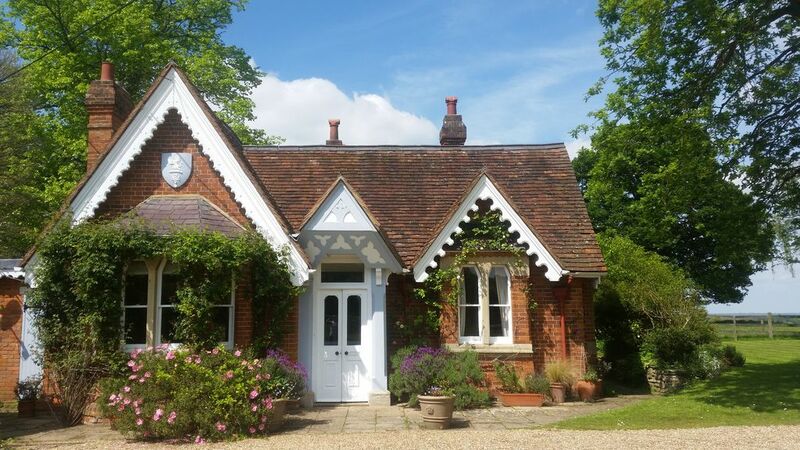 The Victorian Lodge (1876) is a charming and quintessentially English country cottage on a private estate once owned by King Henry 8th. It sits at the entrance of a long driveway leading to the Little Dower House (www.littledowerhouse.com) the enchanting home where Susie and Hamish the owners of the Lodge live. The Victorian Lodge with it's lovely garden and stunning views provides the perfect setting for a small intimate Wedding, whilst the romantic and enchanting gardens at Little Dower House also provide an ideal venue for larger weddings. For larger families wishing to stay at the Lodge, there is also the opportunity to rent the Little Hideaway at Little Dower House, (www.littlehideaway.co.uk), a beautifully and newly finished two storey studio which sleeps two to four adults. The Little Hideaway is a secluded and romantic retreat which makes for the perfect getaway. The area is great for couples, families, country lovers, townies, food lovers, gardeners, riders, polo players, golfers and walkers too. The Cottage is set on a quiet country road, directly opposite the magnificent Windsor Great Park, with spectacular views of Windsor Castle. It's a super warm, super cosy cottage, with a lovely garden in a unique location, on a quiet and private estate of four houses. With private parking, polo ponies in the field opposite the Lodge, great walks, great pubs, Windsor, Thorpe Park and LEGOLAND just nearby, and central London only 35 minutes away by train and Heathrow airport 20 minutes away by car. The Cottage is only 5 minutes away from the Bishops Gate entrance into the Great Park, where you can walk forever, bike ride, horse ride, or just sit by one of the enormous lakes and lap up some of the stunning views. Take a walk in the famous Valley or Savill Gardens, watch a few chukkas being played at Guards Polo ground, or take a ride on one of our own retired polo ponies instead, by prior arrangement. There is a traditional English pub only 5 minutes away, The Fox and Hounds in Englefield Green , situated by the Bishops Gate entrance into the Great Park , serving simply wonderful light bites, great pub food and smart restaurant food. It's the perfect place, and great for lunch, dinner, a snack or a BBQ, and a well earned rest after a walk in the Park. The Lodge has everything you should need, with Sky+ satellite television, high speed Wi-Fi internet, DVD, and a roaring log fire in the sitting room. A Queen size Master bedroom has an adjoining bathroom, a second bedroom with new twin beds that can join to make a King size bed, a study / third bedroom with a small double sofa bed, and two travel cots and two fold out single beds if also needed. The second bathroom has a bath and power shower, and the utility room has a washing machine, dishwasher. microwave and tumble dryer. We live up the long driveway, so we're only 2 minutes away and here to help in any way at any time, whilst you are there or away, but we're always very respectful of your privacy. We live up the long driveway, in an old house surrounded by a lovely garden,(www.littledowerhouse.com) with our son Oliver and our labrador Humphrey. Hamish and I are here to help you with any questions you may have, at any time, but we are very respectful of your privacy. With a large working fireplace (logs and coal supplied FOC), the sitting room is spacious, with two comfortable sofas, an armchair, a pretty baywindow seat a large coffee table, multi channel Sky satellite television, HD television, radio and DVD player. Wentworth, Sunningdale and Windlesham Golf Clubs, amongst others, are 10-20 minutes away. We enjoyed our 4 night stay at this quintessential cottage - it has a lovely garden with a great view of Windsor Castle. The cottage is spacious and warm. It's on the edge of Windsor Great Park. Hamish was very helpful - he even got out some Brio train track for our 5 year old son! Many thanks for a great stay. The Lodge is well equipped and in a beautiful location. Hamish is a lovely host and very welcoming. Highly recommended. Fantastic little gem. Cosy and extremely comfortable and surrounded by nature. Fantastic. Wonderful hosts and s wonderful place. We only stayed for 4 nights but felt relaxed and rested. The view of Windsor castle from the kitchen is magical as was the welcome basket of goodies including wine. We will be back. The Victorian Lodge was absolutely lovely. I could not have imagined a more charming cottage. Everything about our experience here was first rate. Hamish met me and showed me around the cottage and how everything worked. The cottage was immaculate and so completely cozy feeling. We couldn't even eat all the goodies in the welcome basket during our stay. The location was perfect. Very easy access to a train station, Windsor, and London. Also easy access to motorways to go further afield. I wouldn't hesitate to recommend this location and hope to stay here again myself. The lodge really is perfectly situated for quick, easy access to London and, of course, Windsor is a stone's throw away. With a calming atmosphere it was very easy to relax here and enjoy the semi-rural surroundings and the views of the castle. The lodge itself has an abundance of character and charm, and Hamish was so very helpful without being at all intrusive. Being able to feed the horses in the paddock opposite was the icing on the cake. A great place to stay. And thank you for the lovely welcome hamper! Magical, peaceful, a real gem of a find. Can't wait to go back. The owners are a delightfully kind couple who are more than happy to assist with anything. The gardens and the horses in the field next door add to the serenity of the place and the views over Windsor Castle are stunning. Over all, we would truly recommend to stay here. Englefield Green is 5 minutes away, for shops, Indian takeaway, good butcher, bakery & great pubs. There are many historic country houses near by with interesting histories eg Hampton Court Palace once owned by King Henry VIII, Cliveden, and Blenheim Palace (birthplace of Sir Winston Churchill), and so many more. Tourist attractions only 10 mins away include Windsor Castle and Eton College(where Prince William and Harry went to school) nearby Dorney Court and Dorney Lake (where the 2012 Olympic Rowing took place), the river Thames for boating, theme parks at Legoland and Thorpe Park (great for children and adults), Windsor Races for evening race meetings (take a boat from Windsor to the racecourse with drinks along the way ) and Royal Ascot racecourse , Wentworth Golf Club, and Guards Polo . Enjoy the Thames valley and and take boat trip to visit the beautiful old towns of Bray, Marlow and Henley, where the famous Henley Regatta is held. If you are passionate about food (like myself), there are a few Michelin starred restaurants nearby, including The Fat Duck and The Hinds Head ( Heston Blumenthal ) and The Waterside ( The Roux Brothers ) in Bray, a 16th Century village on the river Thames. There is also the Royal Oak in Paley Street, owned and run by Michael Parkinson the famous television talk show host and his son. There are also many traditional English country pubs in the area serving really great food. Royal Windsor Theatre is 10 minutes away, where the West End London plays come to you . London and the West End is 40 minutes away by train where you can see one of its many great musicals, plays, Operas or Ballets. Booking Notes: Available on a nightly, weekly or monthly basis. Payment by bank transfer or paypal using a credit card please. Complete payment must be made in advance and before entering the property. We will be there to greet you with the keys. The rates include all services , sky, broadband, gas, electric, water rates, taxes, gardening, inventories, cleaning and laundry prior to arrival and after departure. Minimum stay 3 nights. Changeover Day: Changeover day is flexible. Arrival and departure times are flexible.